You are here: Home > What Will T-Mobile Talk About Tomorrow? Will They Announce The iPhone Launch Date? 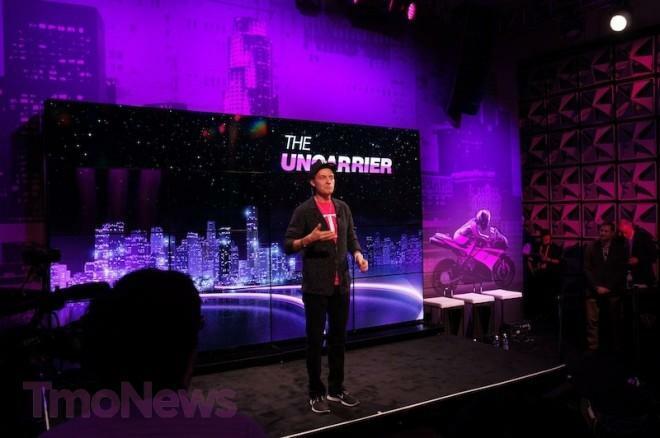 What Will T-Mobile Talk About Tomorrow? Will They Announce The iPhone Launch Date? Tomorrow is T-Mobile’s big, big day with the rumored launch/discussion/conversation of the iPhone, official LTE announcements and the formal unveiling of the new UNcarrier rate plans. It all goes down tomorrow at 11AM ET and while T-Mobile saw fit to not include us TmoNews folk, I’m definitely going to keep a sharp eye on everything that goes down from A-Z. So what can we expect and/or hope to see out of the tomorrow’s special event? According to CNET’s sources, tomorrow is the day T-Mobile finally shows off the iPhone to world. I think it’s a pretty obvious conclusion and yet, it’s possible T-Mobile could ignore the iPhone completely. However, T-Mobile doesn’t throw special events very often so it seems unlikely they’d have another one set up another one specific to the iPhone in just a few weeks. The iPhone has looooooong been expected to arrive on T-Mobile and with the news all the way back in December that it was finally happening, we expect to be shown the goods tomorrow. At the very least, we expect T-Mobile to discuss availability which hopefully includes pricing and a release date. As it stands now, between various talk about retail stores receiving specialized fixtures for a “new device” coming in the next week and a 25-50% increase in retail store man-hours beginning the week of April 7th, we’re hearing April 12th for the iPhone release. Like all iPhone release dates, we’re penciling that date in, although it is a a Friday and Friday’s are the typical iPhone launch day. For now, that’s the current date that keeps popping up. Within the last week we’ve uncovered a leaked list of cities we expect to formally go live tomorrow and OpenSignal tests showing possible LTE markets being worked on. Each of these stories have our expectations set high for hopeful LTE discussions tomorrow. Just how in-depth T-Mobile will go remains unknown and as they’ve already announced rollout benchmarks for 2013, it’s possible LTE talk could be limited to the first round of live markets. The good news is that a number of devices are already on the radar to pair up with the LTE rollout. We’ll see LTE talk, but how much is unclear. With T-Mobile’s new UNcarrier rate plans going live this past Sunday and the information being available for almost a month, these rates are a sure thing for the agenda tomorrow. T-Mobile’s promise to change the subsidy model forever faces an uphill battle, and its competitors are keeping a close eye on T-Mobile’s results with the end of subsidized hardware. The new Value Plans available through company-owned channels and Classic Plans available everywhere else T-Mobile is sold marks a strong statement from the nations fourth largest carrier. Will it help propel them into continued subscriber growth? That’s the million dollar question, but it’s a bold plan and smart money is on T-Mobile’s uncensored CEO John Legere taking the stage tomorrow and outlining his strategy. Tomorrow is sure to a monumental day in T-Mobile’s history and while I won’t be in attendance to take some fancy pictures, you can be sure we’ll have plenty of coverage throughout the day. In DC Metro area, they just flipped the switch for LTE tonight (March 25th). First speed test, 27 down, 25 up with a Note 2 in Arlington, VA. This is a VAST improvement over the HSPA+ if 13 down and 2 up. So I think the LTE announcement is definitely 100% for tomorrow. wow, I’m gonna need a lot more data if I’m running speed tests…lol. I have that old 2 gigs plan. I went online to add more data, and I have to switch to their new value data plan. So for $20 I get 4 gigs of 4G data. I currently pay $10 for 2 gigs. Very cool. I got the update the other day & I noticed they changed the 4G icon. What’s the LTE icon look like? I’m assuming they’re differentiating the HSPA & LTE icon somehow. the “4G” shrinks and is moved up and “LTE” is added under “4G”. Don’t worry, you’ll notice it immediately when you see it. Actually it varies by software. It would look different on iOS than on Touchwiz or Sense. yep, but since he got the update a few days ago, he implies he has the Note 2. In silver spring (just north of DC) also confirming LTE on my note 2. Getting 30 down and 22 up. I’m a bit further out in Woodbridge and looks like LTE may not make it out this far at least at launch but here’s hoping it’s just a timing thing. One thing is for sure: All eyes are on T-Mobile tomorrow and I really hope they deliver. I know, it’s a disservice to my readers! Didn’t you help saving Tmobile from bring eaten by at&devil. And we all participated in your efforts. This is not only disrespecting you , but also your readers. There’s nothing I can do about it, I’m at the whim of whoever makes these decisions. what?! :O but this is the only website that actually gives real T-Mobile news unlike Engadget. The current SIII is not LTE compatible, only the upcoming launch of the SIII-LTE will work. I so hope that these bold moves work in T-Mobile’s favor. So far there are quite a few critics who cannot see the savings. LTE LIVE IN KANSAS CITY ANYWHERE FROM 13MBS TO 14 MBS SO FAR TO 12 MBS ON UPLOAD MY SIGNAL KEEPS GOING FROM 4 BARS TO 2 BARS!!! I’m excited. Please turn the wireless world on it’s head tomorrow, T-Mobile! Plans, Network, blackberry, htc one, and iPhone! It does look like they may have flipped the switch for LTE in the KC metro area tonight. I live in Gladstone, MO (northern part of KC area) and my Note 2 started showing the “4G LTE” logo between 9 and 10 pm. A speed test shows 22 down, 13 up and a ping of 98 ms. Not bad for a start – we’ll see what the speed is like if it stays on! woot woot!!! churn the butter! I sometimes get speeds like this on HSPA+ with my Nexus 4. More consistency with would be awesome. fwiw I’ve spotted a “3g” indicator in the notification bar twice in the last week near the New Orleans/Metairie, LA line. Don’t know that this factors in anywhere or to anything but great for New Orleans area peeps! Okay, I’m about as bib of a Tmo fan as anyone could ever be and all of there recent moves have me very excited for their future! Tmo is gonna turn the entire market UP-SIDE-DOWN! under the apn you made did you put it on ipv6 or ipv4 and ipv6 i ask cause my note 2 was on ipv4 only when it should have been on both i wanted to know if you put yours on 6 will you see a speed boots cause lte runs on ipv6? Pretty soon Verizon will have to change that “More 4G LTE cities than all 3 other carriers combined” ad on their website. Super excited for all you folks that are able to utilize the LTE! C’mon TMO….the rest of us are waiting impatiently!!! Just started to get 4G LTE signal on my Nexus 4;) here in Houston TX at 1am. I can confirm. Houston we have lift off! DL speeds of up to 14 Mbps UL up to 9Mbps with only a slither of signal (2 bars). Im on the west side of the city. Wait! Is your LG Google Nexus 4 rooted and downgraded or are you running android firmware 4.2.1? I want to run 4G LTE on my T-Mobile LG Google Nexus 4 aswell! iphone 5 is for sale online as of now on tmobile uk website!! it has a similiar chipset to the galaxy s3. thus released on tmobile it would be a no. Ahhh Vegas. How I miss living there. Well 4G LTE just barely came out in a few States today and yesterday as well. So it will take maybe a few hours or a day to adjust. I’m sure T-Mobile is on the case. I can’t wait to see today in my City! Thanks! They’re probably starting with the East coast first, huh? Well, I added 4GB of Mobile Hotspot High Speed Data to my T-Mobile contract. I went from paying one line for unlmited everything $81, to $106ish dollars a month lol. I also added caller tunes. Well, now I can use my T-Mobile blazing fast 4G LTE network on my laptop when I’m out, downloading music, streaming Netflix etc. That’s how horrible my Wi-Fi and building penetration for my T-Mobile network data is. I had to add mobile hotspot because it takes bloody forever to upload videos on YouTube and download songs off Itunes. Well, anyone else excited today? 4G LTE and IPhone 5! Yeeeaaahhhhh! LTE officially launched in Phoenix!! I don’t usually get a strong connection in my house (I don’t really care because I have WIFI) but I turned my WIFI off to test my connection and It went from my usual 5Mbps to 11Mbps with the LTE logo showing. I’m pretty satisfied because I usually get 15-20Mbps at work and other areas so I’m excited to see what LTE will bring. Probably 40-70-100mbps at work for you. Come on! I want 4GvLTE already! My City was on the list! So you didn’t need to use a new APN right? David I am kinda perplexed you did not get an invite from T-Mobile. Shame on them. Lte is live in Kansas City but it’s going in and out of service. Anybody else experiencing this? Hmm. Still no T-Mobile 4G LTE here in San Jose CA. Sigh. Well time to go to sleep. Hopefully I have 4G LTE by the time I wake up. According to Engadget, the network is live in San Jose!